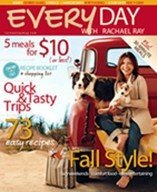 If you don't have a subscription yet to Every Day with Rachael Ray, you really need to join the crowd and get one! Circulation Management looked at magazine performance in the first half of this year and says that "the real bright spot was the stunning debut of Every Day with Rachael Ray. Although there were only three issues published in the first half of the year, the publication posted an average per issue newsstand sale of 521,000—one of the flashiest premiers in many years." Rachael Ray's success was contrary to the industry trend, which consisted of a revenue decline that "was the largest in the last seven years and, perhaps, the steepest revenue percentage downturn in the last 50 years." That's right people - it's flashy and successful, too. I do truly recommend the magazine because it has outstanding recipes with pictures of how a recipe should turn out, plus a light-hearted approach to cooking and travel. You can see Rachael's involvement throughout the magazine (and her picture on every cover, just like Oprah!). That stinks that you can't get a subscription. Maybe that'll change as it gets more subscribers. I will keep my fingers crossed for you.